The sound of engines thundering the hills as the sun sets down below the trees. 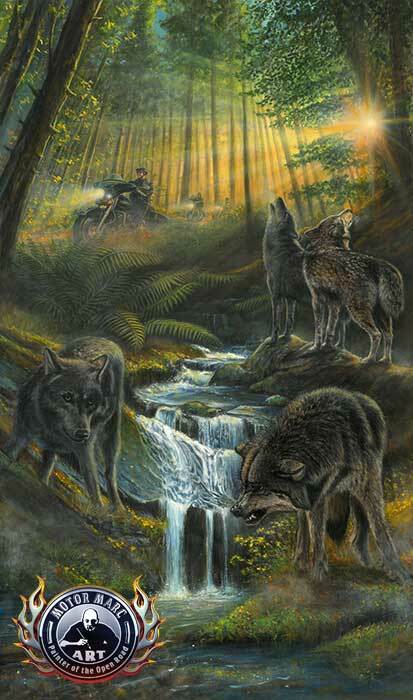 Bikers awake the wolves while they howl in the presence of the bikers as they trespass through sacred land. Dominance is set as the leader of the pack claims his prey and the men riding their powerful horses find adventure through the beauty of Mother Nature. This is the first of a new wildlife series mixing the beauty of nature and the open road. 20" x 30", 28" x 48"